It was a warm summer day and I was walking through the streets of Vienna when the noise of my phone indicated that I had received an E-mail. It was from ELSA and informing me that I had been chosen to participate in the Turku Summer Law School on Corporate Social Responsibility from Aug. 2nd to Aug. 9th 2015. I let out a scream of joy – yes, people were looking – and accidentally sent my mobile on an unscheduled flight. That was the day I crashed my smartphone beyond repair. On Aug. 1st I left Vienna by plane to Helsinki Vantaa where I arrived in the middle of the night. After a good night’s sleep I took the bus to Turku. And boy, was I nervous and excited! Would my roommates be nice? Would I fit in the group? Will I be able to follow the lectures? And what about the moot court? Since I’ve never been in a moot court before, this was particularly exciting for me. The bus ride was also quite challenging since the bus driver only talked in Finnish and at that point I could only understand words like “Kiitos” and “Anteeksi”. So I was not sure, when my station would come up. In the end I managed it. It was three in the afternoon when I finally arrived in Turku. I was heartily welcomed by Veronica, Hanna and Jarl-Johan and showed up to my room at Hesehotelli. It didn’t take long until I got acquainted with my roommates who had already arrived earlier that day. In the evening we had our first official event: The welcome party. It took place at the law students association’s party venue where we were fed properly and introduced to our very first Salmaria shot. Oh and of course we learned how to say cheers in Finnish “Kippis!”. But since we all were quite tired from travelling that day we went home early that night. The next day we all met in front of Hesburger to walk over to Turun yliopisto where we would get breakfast and the much needed coffee and then the lectures were about to start. First we had an introduction by Jaako Salminen and were divided into work groups for the moot court cases. I have to say I was really glad about the outcome for I was teamed up with the lovely ladies Paola, Lucy, Anni and Dilara. And yes, we were representing the “Superbad Guys”. Our client was Afrimex UK ltd. a company that imports cassiterite and other minerals from the Democratic Republic of Congo. Problem was, that they cooperated with companies in the DRC that received those minerals from mines that support forced labor as well as child labor. But we were up for the challenge and really motivated. At five the lectures ended, then one hour time to change and off we were to the sea where we would have dinner and sauna. After that some of us went on to a bar in Turku where we once again were able to taste the most delicious Finnish beers. Next day in the morning: Off to university! Consumer’s Ethical Responsibility, CSR and Contract Law, Directive on Non-Financial Reporting and time to work on the moot court cases was on this day’s schedule. For me, Sirpa Pietikäinen’s lecture was the most inspiring one. It was more than a pleasure to listen to her and engage in a discussion. And one could really notice that everyone was on fire. Even when not in class we had heated discussions on CSR, how CSR is incorporated in each of our native countries and of course how studying law looks like in the different countries. What a spirit. But the most fun I had was with my moot court team. We read through the case brief, discussed the OECD Guidelines for Multinational Enterprises and talked about ways how we could convince the jury that our client is not in any way involved with the happenings in the DRC. A difficult task but since everyone was very competitive we enjoyed the hard work ahead of us. We divided the research equally between us and would meet again the next day to reveal our findings to each other. After a short time at the hotel we were on for sightseeing. We picked up bikes and divided into small groups. 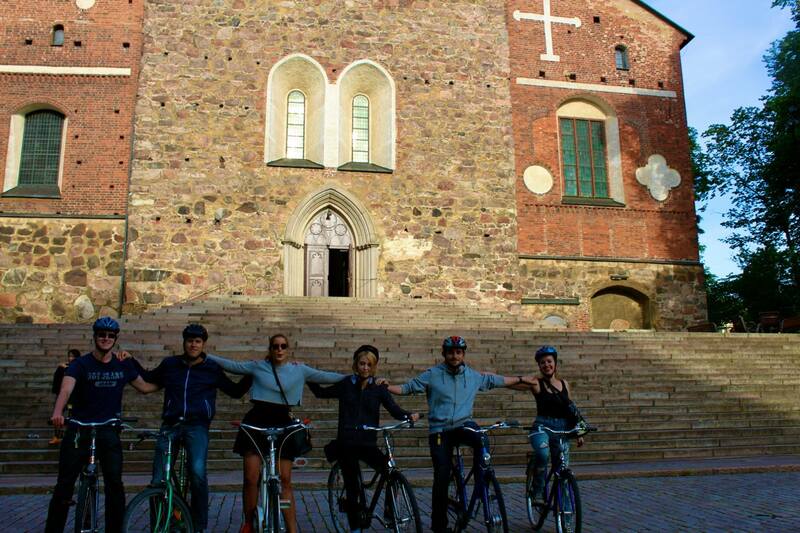 Each group was led by someone who knows their way around Turku. Monica, Max, David, Stephan, Filip and I were in the group led by Noora. We cycled around Turku and stopped for various sights. First, we visited the church where Jussi provided us with interesting historic informations on the church and Turku in general. Then we had a quiz in front of the Library. Max won and got Tyrkisk Peber. Later on we had a lot of fun trying this unusual sweet and I have to say, I have gotten a relatively strong addiction from that. ELSA Turku, I blame you for that. ;-) Afterwards we drove to the castle where we had Pizza in the park and chased some seagulls. Then we went to the boat bars and of course for our first time to Club Marilyn. After a short night’s rest, we went to university again. We dug deeper and deeper into the subject of CSR and heard especially about the practical meanings of CSR and how it is achieved in firms like Eversheds and PWC. In between breaks my team and I met for further discussing our case. We started talking about what the opposing team from Global Witness could throw at us and how we could disarm all of their arguments. In the evening we had dinner at the loveliest restaurant that I have ever visited. And the food, just amazing! After that we headed to the boat bars again and to Club Marilyn, where we received the traditional student badges. I think all of us were a little sad, that we didn’t have overalls to sew them on. After lunch we had five hours to get the final preparations for the moot court done. We gave each other tips for our speeches and met with the opposing team to discuss our strategies. Then after a short break we went to Naantali. We had dinner at a beautiful restaurant at the seaside and then we walked around the beautiful small town enjoying the sunset. It was magical. Back at the hotel I met again with my teammates to work on the case. Back in our rooms we practiced our speeches and my roommates and I run our speeches in front of each other. This was especially fun because Mari was on the Global Witness team and also would do the rebuttal for her team. We asked each other the most uncomfortable questions we could think of and tried to answer them as detailed as possible. At 1:30 AM it was time for another group meeting. We met in the hallway and read our speeches to each other. It was nearly 3:00 AM when I returned to my room. At 7:15 AM I met with my teammates in front of the hotel to meet Anni at the university. We ran our speeches in the correct order, did some last minute adjusting and then we got coffee for everybody. I think I had five cups that day. Our case was up after the lunch break. We skipped lunch and tried presenting in the lecture hall to get used to the surroundings. We were dressed to the nines and ready for a fight. And our hard work had paid off, everything ran smoothly and we got great feedback. 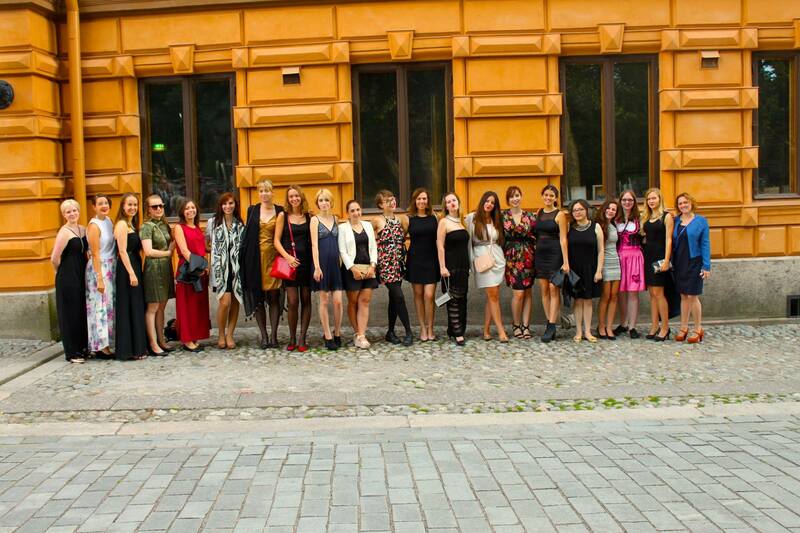 In the afternoon we had some much needed free time for preparation for the Gala Ball and the certificate ceremony. At 7:30 PM we all were dressed up in our evening gowns and picked up by the taxis which brought us to the venue of the Gala Ball. It was a beautiful place there. Then after the group pictures the Gala Ball started. But it was a bit different from what I expected. You see, if you tell an Austrian that there is going to be a ball they expect ballroom gowns, dancing (mainly waltz) and drinking champagne all night long. 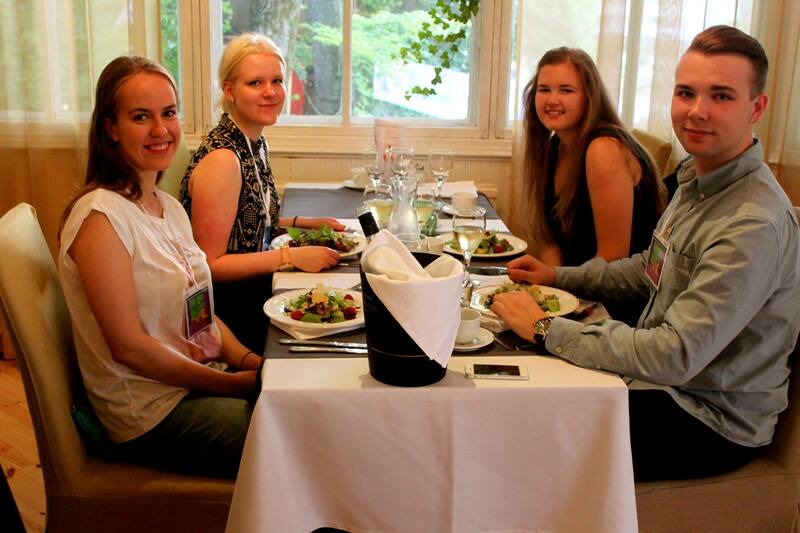 But in Finland it looks like this: You are seated at a table in a strict seating order, and there are a lot of rules. If you break them, you get punished. There is a lot of singing, eating and drinking. Boy, that was so much fun. Afterwards we went on to a really great club in Turku. There were several floors, it was pretty huge there. We stayed until the club closed down at 4:00 AM. At least some of us. The night was concluded by late night burgers at Hesburger (I miss Hesburger so much!). Perfect ending to a perfect night. The next day we went to Maisaari, a little island in the Turku Archipelago. We had a lot of fun on the two-hour boat ride. We had lunch at the little cottage at the sea and of course sauna. And we went swimming into the sea. It was cool and beautiful to swim in. Despite the snake in the water. Still have bad dreams about that… But too soon it was time to go back to Turku. In the evening we had the farewell party. We tried different drinks from different countries, danced, laughed, played billiard and yes, we felt the ELSA spirit through and through. But this night was kind of sad, because the later the evening got more people were leaving to go back to the hotel. So we had to say lots of goodbyes. In the morning it was time to leave. I went on to Helsinki (the most beautiful, exciting, stunning city in the entire world!) to spend some time there. I met amazing people at the SLS. I can now say that I have friends all over Europe. And I really got hooked on the subject of CSR. Back home I’m now devoting some of my studies especially to that specific field of law. And I fell in love with Finland. I started learning Finnish and I’ll be moving to Helsinki this spring for some months. And I’ll be doing my exchange semester there. 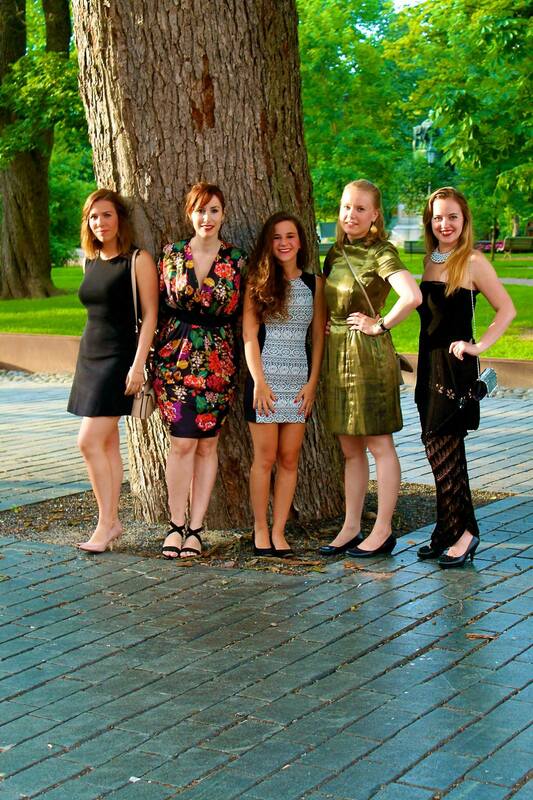 So thank you Turku Summer Law School and ELSA, you really changed my life and I am so thankful for that.